While certain diets or foods may not ease depression (or put you instantly in a better mood), they may help as part of an overall treatment plan. 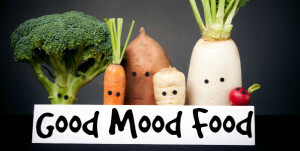 There’s more and more research indicating that, in some ways, diet may influence mood. We don’t have the whole story yet, but there are some interesting clues. Basically the science of food’s affect on mood is based on this: Dietary changes can bring about changes in our brain structure (chemically and physiologically), which can lead to altered behavior. So how should you change your diet if you want to try to improve your mood? You’ll find eight suggestions below. Try to incorporate as many as possible, because regardless of their effects on mood, most of these changes offer other health benefits as well. Here’s the catch, though: While tryptophan is found in almost all protein-rich foods, other amino acids are better at passing from the bloodstream into the brain. So you can actually boost your tryptophan levels by eating more carbohydrates; they seem to help eliminate the competition for tryptophan, so more of it can enter the brain. But it’s important to make smart carbohydrate choices like whole grains, fruits, vegetables, and legumes, which also contribute important nutrients and fiber. In recent years, researchers have noted that omega-3 polyunsaturated fatty acids (found in fatty fish, flaxseed, and walnuts) may help protect against depression. This makes sense physiologically, since omega-3s appear to affect neurotransmitter pathways in the brain. Past studies have suggested there may be abnormal metabolism of omega-3s in depression, although some more recent studies have suggested there may not be a strong association between omega-3s and depression. Still, there are other health benefits to eating fish a few times a week, so it’s worth a try. Shoot for two to three servings of fish per week. Eating breakfast regularly leads to improved mood, according to some researchers — along with better memory, more energy throughout the day, and feelings of calmness. It stands to reason that skipping breakfast would do the opposite, leading to fatigue and anxiety. And what makes up a good breakfast? Lots of fiber and nutrients, some lean protein, good fats, and whole-grain carbohydrates. Part II will be published next week!